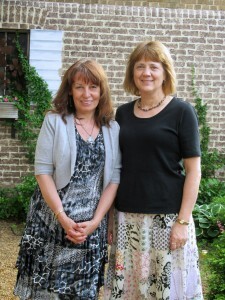 Rosalie Petrouske and Lori Hudson were the first of the Writing at the Ledges group that participated in the Grand Ledge Public Library’s Authors in the Garden Event on Thursday, June 13, 2013, and it was a great success. “We loved bringing our stories to the public in such a lovely setting as the Grand Ledge Public Library garden,” says Petrouske, who writes poetry and short stories. “It was a great event and we hope everyone enjoyed it as much as we did,” added Hudson. The next Authors in the Garden event featuring a WATL author will be Thursday, June 28, 2013. Randy Pearson will read from his book, Driving Crazy. The program begins at 6pm and ends at 7pm. While you’re in downtown Grand Ledge, you can check out the Music in the Park immediately following.